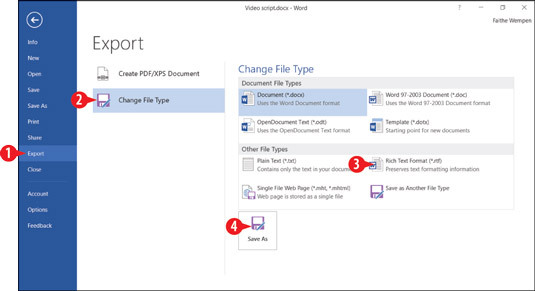 When you share a document with other people, you are assuming they have Microsoft Word or another application that opens Word files. These days that’s actually a pretty safe bet, with all the options available for opening Word files. WordPad, which comes free with Windows, opens Word documents, and the Word Online program at office.live.com is free to anyone with a Microsoft account. Nevertheless, you might still want to convert a Word document to some other format in some cases. 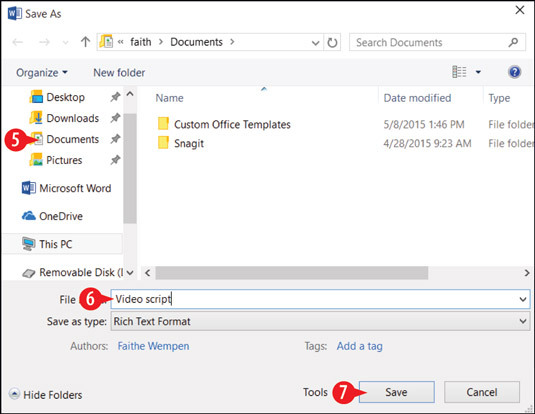 For example, you could save a document in Word 97-2003 format for backward compatibility with early versions of Word, or you could save in Rich Text Format (.rtf) for compatibility with just about any word processing program in the world. Click Save As. The Save As dialog box opens. Choose another format in which to save the document. Instead of steps 1-4, you can choose File→Save, click Browse, and then change the setting in the File type drop-down list. Navigate to the desired save location. If desired, change the file name. The Save as type setting should match what you chose in step 3.